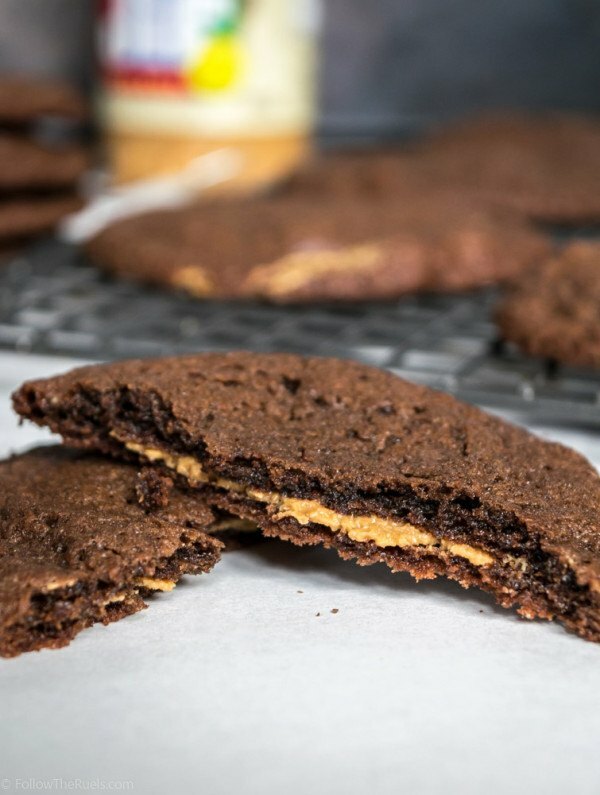 A moist and chewy chocolate cookie filled with a delicious layer of peanut butter. Preheat over to 350 degrees In the bowl of a stand mixer, beat together butter and sugar until light and fluffy, about 1 minute. Slowly beat in eggs and vanilla. In a separate bowl, mix together flour, cocoa, baking soda, and salt. Slowly add it to the butter mixture and mix until incorporated. Gradually pour in melted chocolate while mixing at a slow speed. Fold in chocolate chips. Spoon about a tablespoon of dough on to a baking sheet. Create a small divot in the ball of dough and spoon about 1 tsp or less of peanut butter into the divot. Top off with another tablespoon of dough and press edges together to close in peanut butter. Bake for 12 to 15 minutes until cookies have flattened slightly and are no longer shiny on top. Let cool on a wire rack.